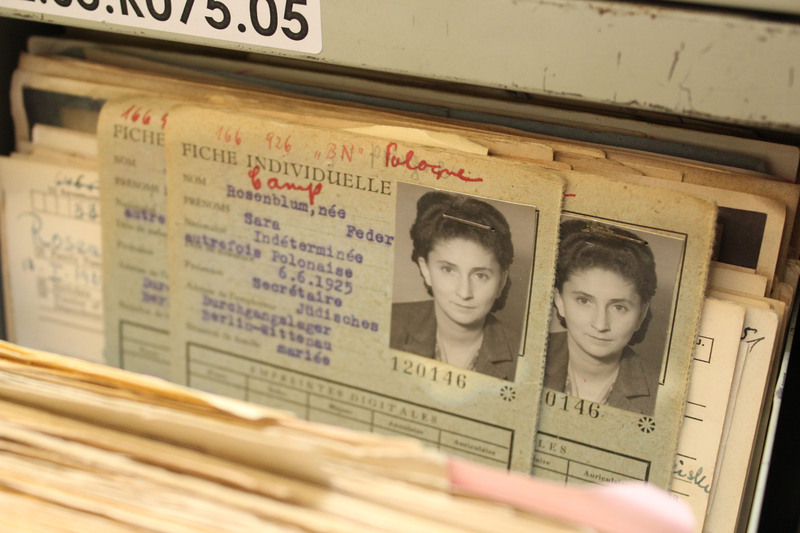 Archivists, historians and relatives of people who’ve been involved in the Holocaust all struggle with the same problem when exploring the vast sea of data related to that epoch – they are not able to obtain all documents related to a given person. There could be several reasons for that – the documents are spread over different databases across the globe, some of them may be available only upon authorized request, or simply available only on paper or scanned images which are difficult to search. Moreover even if all records are digitized and accessible online, a search machine may not be able to understand that they indeed relate to the same person – something which could be obvious for a human. We’d like to share more about the latter case below. We’ve been exploring the USHMM survivors and victims database, it contains over 3 200 000 person records (as of June 2015) gathered over time from heterogeneous sources. To be more specific, here is a person record of Zoltan Grun. It contains some data about him such as location and date of birth, information about his mother, location and date of death, as well as which is the source of all that information. In this case, it is a document “HL0115001” in the USHMM archive. Some of the persons in the database are represented by more than one such record. The records come from different sources – lists of arrests, lists of convoys, etc. Different records may contain various information – some may be more complete than others. Even if a bunch of records contain information about the same person, they are not linked to each other. 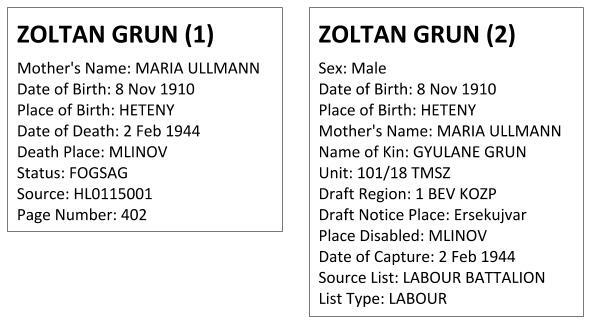 Both records are related to a person called Zoltan Grun: the dates of birth are the same; the places of birth too; the name of mother in both records is the same; the place of death of Zoltan (1) is the same as the place where Zoltan (2) got disabled. For a human, these similarities may be enough to consider that these two records are describing the same person and need to be linked. However, for a machine algorithm this is not always so easy and we’ll see why. Since the exploration of person data is one of the most common tasks in the Holocaust research, we consider it important to find an automatized way to link these records and allow for better search and discovery of data related to the survivors and victims of the Holocaust. We call this task record linking or also record deduplication which is achieved through record matching. The final goal of this task is to have a single record representing each person that contains the references to all the separate records related to him available from the different sources. Record normalization and enrichment – we transform the properties to their normalized values and where possible we link them to existing knowledge base concepts. Classification – we classify each person record against a number of similar candidates to find out whether they are indeed duplicates or not. Clustering – we use the result of the classification step as a distance measure between the records and cluster them in groups. Each group of records represent a single person. Figure 1. Person Record Linking Workflow. (1) place_of_birth: “Mukacevo (Czechoslovakia), Czechoslovakia” in one record and “Mukačevo” in another record. (2) name: “Schmil Zelinsky” in one record and “Schmul Zelinsky” in another record; both records are related to the same person. 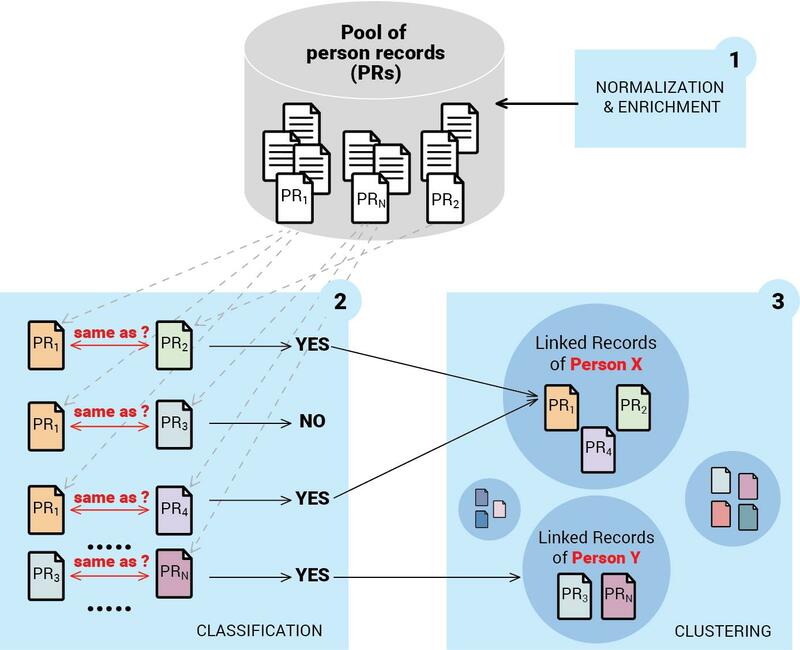 Similarly to the human, our machine algorithm classifies whether the two records are related to the same person or not based on the comparison of the separate properties of the two records. Now, you can imagine how difficult it is for a machine to judge whether the two Schmil Zelinsky/Schmul Zelinsky records are actually related to the same person. To find out if they are, we add some heuristics, which help us make the matching of the two records possible. In addition to the variation of the literals, the properties are sparsely distributed, which could be seen in the figures below. Figure 2. Distribution of properties appearing over 10 000 times in the database. Figure 3. Distribution of the number of statements (properties) across the number of person records having the same number of statements. From these figures we see that only 40 properties (out of 375) appear more than 10 000 times in the database of over 3 mln records (Fig. 2). The most popular properties are dateBirth, placeBirth. The majority of the records (96%) have between 2 and 9 properties only, which fall into the bell of the distribution in Fig. 3. The number of records having larger amount of properties is so small that they can be hardly visualized on this chart. It turns out that our algorithm could rely on a very limited number of properties which could be used for making a decision whether the two records are duplicates or not. We chose these properties based on occurrence, i.e. we selected the ones that occurred most often together – name, date of birth, date of death, place of birth, place of death, gender, occupation and nationality. convert the name to title case. Another property of the person records, which we adjusted, is the gender. It is an important characteristic when judging whether two records correspond to the same person. However, it is often missing. We applied two different procedures for predicting the person’s gender and filled in the missing values in the database. If there were persons with different gender but with the same name, we did not assign a gender for the records having that same name and unknown gender. Otherwise, if there was another person with the same first name and known gender, we assigned the same gender to the person with unknown gender. Finally, as part of the matching task, we also worked out the locations which are available in the person records – place of birth, place of death or place of arrest and other locations. They are also available as literals only and may be written in various ways as in the example with Mokachevo above, so we normalize them by resolving them to GeoNames locations with the help of a service developed by Ontotext, which is specifically adjusted to the EHRI specific domain. The GeoNames URIs are also added to the database and used to train our statistical algorithm. By georeferencing, the literals which point to the same geographic location, no matter of their lexical representation, are also referenced by one and the same GeoNames URI. This way when we facilitate the computation of the similarity between locations and avoid the lexical differences in the way they are written in the person records. Machines learn by examples, similarly to the way kids do. When we provide enough positive and negative examples for given fenomena, the machine algorithm learns to recognise whether a new given example is positive or negative. For the linking task, our positive examples were couples of person records for which an expert looked up the data and considered them indeed duplicates (positive examples). In the same way, experts collected also pairs of person records which were obviously related to different persons (negative examples). There were also some examples for which the experts could not find enough information to take a decision and considered them as uncertain. We collected 1509 such pairs in total comprising the three cases – positive, negative and uncertain. We chose the top 1000 records by count of their properties and by an iterative procedure for suggesting candidates (including pairs having the same name; same last name; similar date of birth and similar place of birth; same first name and same last name; and similar birth date; etc.). Another part was selected relying especially on the attributes which show more value like first name, last name, date of birth and place of birth. We selected records having these properties and grouped them by place and date of birth and selected the top 500 pairs from the groups. Then we added also some 9 examples which we collected ad-hoc and represented interesting cases. Beider Morse Phonetic Codes Matching – taking in account the way the names sound, not only the way the names are written. Once the person record pairs are transformed into such vectors (classification instances), where each vector element has the meaning of how similar the corresponding properties of the two records are, we considered that the algorithm had enough information to learn correctly. So, we supplied our ground truth data to the algorithm and let it learn. The algorithm we used is multithreaded sigmoid perceptron classifier. 43% F1 for the class UNCERTAIN. The mean macro F1 score is 75%. Once we have classified the incoming pairs as positive, negative or uncertain, we want to cluster them in a way that each cluster represents a unique person among the set of all clusters. 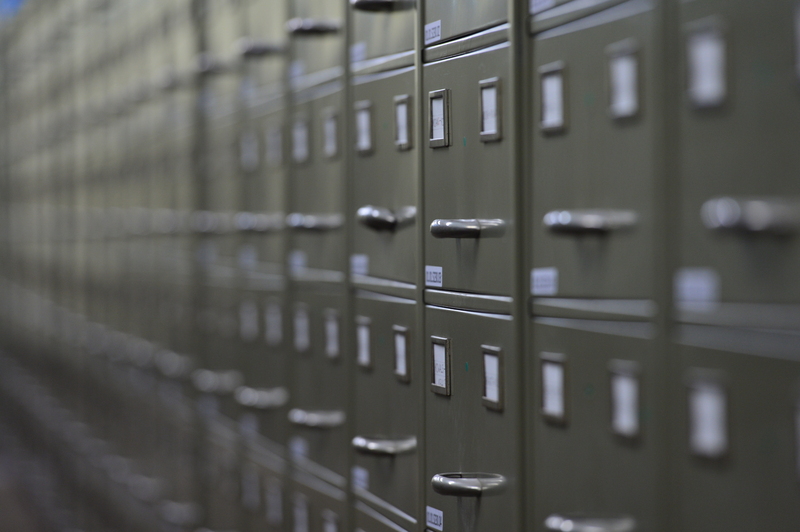 In one cluster there may be one or many person’s records, all related to the same person. Each clustering algorithm requires a measure of distance between two instances in order to decide whether they are close enough to be in the same cluster. As a distance measure, we use the probability assigned by the classifying algorithm for the given pair of instances to be labeled as POSITIVE. The clustering algorithm is DBSCAN. The algorithm was first validated on the training data and then run on the full database and here is what we obtained (Fig. 4). Example (1) A cluster of 3 records: The family name of the first person is different from the other two but it sounds suspiciously close and his birth date is also very close to the others. 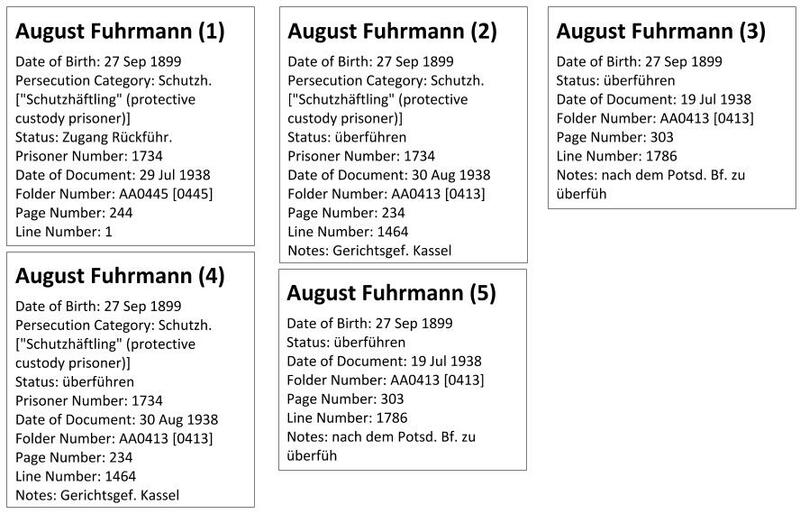 Example (2) A cluster of 5 records: All records seem to refer to the same person August Fuhrmann. 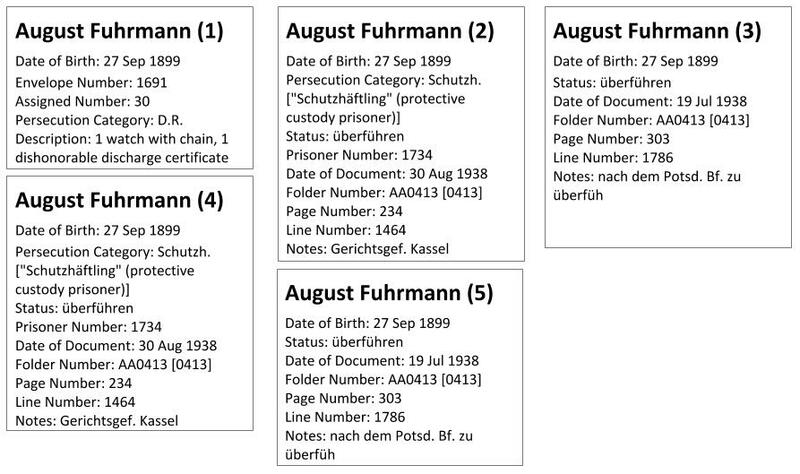 Example (3) A cluster of 5 records: Here we see a separate cluster which seems to contain records referring again to the same August Fuhrmann and needs to be merged with the cluster in Example (2). Thorough evaluation of the clusters and error analysis are still to be conducted and if necessary adjustments to the clustering procedures can be done. This was an initial study on the USHMM Survivors and Victims Database which aim was to prove the applicability of our approach to record linking. It showed that the task is feasible and could be performed with quite a high accuracy. With the cooperation of a human and such an algorithm, the records of over 250 000 people who were involved in the Holocaust could be interlinked in comprehensible amount of time and effort. On the way this will propagate to improved retrieval of documents regarding concrete personalities and will facilitate archivists and researchers in their work and will help the relatives of these people to find out more exhaustive information about them. By solving this task we get one step closer to overcoming the main challenge of Holocaust research – the wide dispersal of the archival source material across the globe. Furthermore, by supporting the work of an extensive network of researchers, archivists and private individuals, EHRI is able to initiate new transnational and collaborative approaches to the study of the Holocaust. At the time the name records from the USHMM Holocaust Survivors and Victims Database was shared with EHRI partners for the purpose of this kind of research in 2015, there were approximately 3.2 million name records published on the web. There was a much larger number of records available internally, but that could not be published on the public web due to various restrictions. As Ivelina Nikolova indicated, these records were collated from many thousands of sources, each source coming with its own characteristics, history, metadata fields, and restrictions. Currently there are 5.7 million person records published on the web (of about 7.5 million total in the HSV database).